Tashard Choice has been a lightning rod for Cowboys fans so far in 2011. Other than DE Igor Olshansky, no Cowboy has been more of a lightning rod for trade discussions or calls for him to be cut than Tashard Choice. Now that Marion Barber has moved to Chicago, the Cowboys have had quite the competition in camp at the running back position with 5 backs all vying for 3, maybe 4, spots. Tashard Choice, according to some, should be the odd man out. I don’t thinks so. Choice had a tough start to 2011. He ran into injury trouble the first morning of training camp and was out for 3 weeks and finally returned to practice yesterday. The injury to Choice, as well as rookie DeMarco Murray, had given a couple of young guys the opportunity to show what they can do backing up Felix Jones in practice. Undrafted rookie Phillip Tanner and second year man Lonyae Miller have had strong camps. While only Tanner has translated that to the field during the preseason games, the coaches are impressed with both. Here is what I don’t understand: How can Cowboys nation turn on Tashard Choice? Choice, a fourth round pick out of Georgia Tech in 2008, has seen his production decline slightly since his rookie year when he took over for an injured Marion Barber and Felix Jones. During his rookie year, Choice came off the bench in week 14 to face the number one defense in the league (Pittsburgh Steelers) and rose to the occasion. The then rookie, managed to rush for 88 hard earned yards in a game that was critical to the Cowboys. While they did end up losing the game, Choice was not the reason. 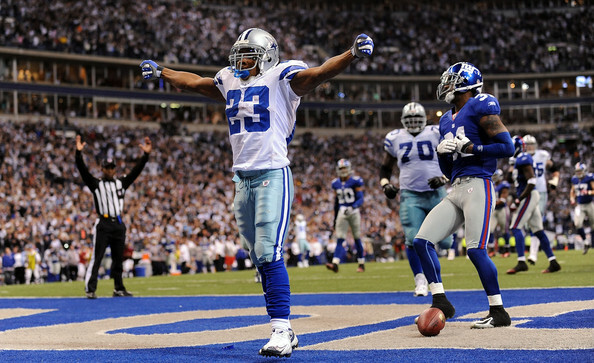 It was this game that Choice endeared himself to Cowboys fans with his hard running and refusal to go to the ground. Choice saw his role expand over the final four weeks of the 2008 season and looked like a great option moving forward. In 2009, Choice continued to be a spark plug in the offense while remaining the number three option in the backfield. Still behind Barber and Jones, Choice had to buy his time and take advantage of any opportunity. The Cowboys had gotten off to a slow start and were heading into their week 5 matchup with Kansas City with a 2-2 record and all the pressure in the world on their shoulders. The Chiefs gave them all they could handle. Enter Choice, who, while only having three carries, racked up 92 yards including a beastly 38-yard touchdown run that finally got the Cowboys offense rolling and created enough momentum for the Cowboys to eventually win the game in overtime. While it was a brilliant, albeit short, performance for Choice, he was overshadowed by Miles Austin who had his break out game. A few weeks later, in the Thanksgiving Day matchup against the Raiders, Choice again supplied a spark plug breaking off a 66-yard run. He finished the game with only 3 carries for 67 yards. It became clear that the Cowboys had something in this second-year back. Then came 2010. It seemed that Choice had fallen out of favor with the coaching staff. He did fall out of favor with the fans when he fumbled the ball right before halftime in week 1. The Cowboys were down in Washington 3-0 with :04 seconds left in the half. Romo dropped back to throw deep from his own 39 yard line and was under a lot of pressure. Instead of heaving the ball down field he flicked it to Tashard Choice, who in hindsight should have just hit the turf and ended the half. Instead, he was gang tackled and coughed the ball up and Washington’s DeAngelo Hall returned it for the touchdown and 10-0 lead the Redskins would not relinquish. Whether it was that play, or something in practice, or maybe another side of his game, Choice found himself on the pine for 5 out of his next 8 games and only received 6 carries in that span. Then some injuries hit and in week 13, Choice again responded as a spark plug. In Indianapolis, playing in Jason Garrett’s fourth game after taking over from Wade Phillips, Choice got a chance to once again show what he can do. He shredded the Colts defense racking up 100 yards on 19 carries, adding a touchdown. That game seemed to have sparked a little confidence in Choice for the rest of the season. He remained in Garrett’s plans for the rest of the 2010 season. Enter the 2011 season. The Cowboys take RB DeMarco Murray in the third round of the NFL Draft. The Cowboys ship out incumbent starter Marion Barber, and Choice enters the final year of his contract. All of a sudden Cowboys fans think they should trade off their “spark plug”, or worse, cut him. I want to propose that the Cowboys keep Choice. It makes sense. We’ve seen very little from the undrafted players (Miller and Tanner). You say, “Wait, Tanner has been impressive.” I agree, Tanner has caught some attention with his hustle and burst while running, but keep in mind he is running against the third string players on both the Chargers and Broncos. But when it comes to the regular season, do you want an unproven rookie in Tanner or Miller there when Felix Jones or even DeMarco Murray goes down with an injury? To me it is clear, Tashard Choice has a lot of potential and he deserves the shot to back up Jones and maybe even take playing time away from both Jones and Murray. Let’s face it, Murray is coming into this season with no mini-camps, no OTA’s, and he missed over half of training camp and preseason. Murray will not be ready for the season. Choice is ready. All he has done when given the opportunity is turn games around for the Cowobys (with the obvious exception in Washington). Now, Choice has also missed a lot of practice and finally returned yesterday with Murray. The coaches don’t seem quite ready to give up on him, in fact, they seem to like having him back, “He knows the system and we know what he brings to the table,” Peete said. “He’s just getting back healthy again. And he brings some energy out there. You can hear him talking a lot and trying to get his teammates pumped up.” That is one thing this team needs. Someone to bring up the energy. For me, while I like Tanner, I just don’t think you can afford to lose Choice. He provides some power running and great hands out of the backfield. Murray isn’t ready and won’t be for a few weeks. I just think it is too early to give up on a guy that provides one of the biggest things this team needs. A spark plug.